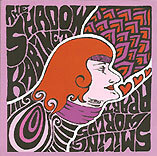 A musician as well-versed in the psychedelic trappings of sixties pop as Steve Somerset ought to know how to deliver the goods, and deliver he does, rather triumphantly, on this, his second album as the Shadow Kabinet. Five years in the making and releasing, Smiling Worlds Apart is an altogether different beast than its predecessor, Hark! It is, in fact, an even-more polished, more confident and knowing modern soft-psych masterpiece, one that benefits from a continuous first-to-last note listen and committed ears. Fact is, it's a tremendous achievement whichever way you listen to it, and as such, it is one of the best pop music releases in recent memory. There is a finesse to Somerset's craftsmanship that comes from the singular way he has absorbed the essence of British pop and filtered its markers for use in his own music--a deft, discerning approach that renders his songs veritable snapshots of British pop song types in an age where there is little reverence for pop music history. For Somerset, what's important is that what has come before is not lost or forgotten, that is given new life and new meaning in a contemporary light--that it makes you think, and groove, in the same moment. Somerset's tempered gravitas is no more evident that in the symphonic opener, "There Must Have Been a Moment," the first of three songs that form a sort of suite. The orchestra tunes up, the musicians settle down, the strings summon up the vocal, a tender testament to the power of truth. The beautiful arrangement gives equal rise to the varied instrumentation and influences, both eastern and western, and quickly fades down to usher in the second song, "What Am I Supposed to Do? ", a more traditional soft-pop number that take the truth posited in "Moment" and questions what is to be done with it. And after all that, given the pitfalls of life, the question becomes "Why do you do it? ", the "it" being living amidst the yin and yang of it all. The answer is posited in the third song, " You Do It 'Cause You Love It"--you do it because there is no viable alternative. There is a finesse to Somerset's craftsmanship that comes from the singular way he has absorbed the essence of British pop and filtered its markers for use in his own music--a deft, discerning approach that renders his songs veritable snapshots of British pop song types in an age where there is little reverence for pop music history. Such keen observations might come across as empty without the musical foundations that Somerset has crafted to ground them. His guitars, picked and strummed with notes straight, slid and delicately, slightly bent, mix with various keyboard sounds and percussion both traditional and cleverly reoriented to form soundscapes that work in tandem with his lyrics to form total packages bursting with emotion. There is much to be absorbed in these songs, both musically and lyrically. The joys and delights and deep thinking--all of the various colors of Somerset's musical inclinations--extend even to the faux country of the delightful, barbershop saga "Bad Hair Day," a two-minute confection that displays the Kabinet's sense of humor as it breezes along its merry path. Smiling Worlds Apart winds down to the playfield-leveling closer, "These Days," in which dark and light come to a crossroads and, perhaps mirroring real life, neither necessarily overtakes the other, because life is more shades of grey. I'd like to think that in those shades of grey lies a ringer who chooses happiness, and I'm sure that Somerset agrees, for even on a bad hair day, there is hope amongst life's split ends.